The Fixed Regiment of Spanish Louisiana primarily depicts Infantry of the Line, Artillery, Distaff and Grenadiers. The Regiment also has a small group of members who portray Cavalry-Dragoons, mounted and dismounted. 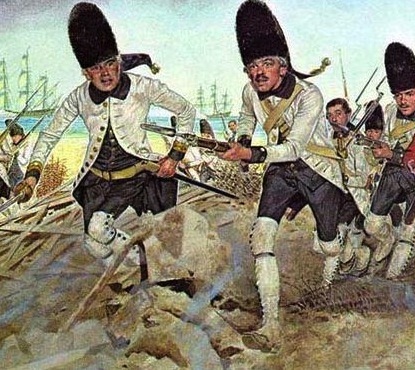 The Regiment is adept at recreating a light infantry and corsair-privateer impressions when needed. Infantry of the line were the core soldiers on the field and provided the anchor for the battle. The line was considered the fundamental battle formation as it allows for the largest deployment of firepower on the field in concentrated areas. The infantry was aligned in long thin lines to fire volleys fighting in tight formations, but were also trained to swiftly adopt square formations for protection and columns for rapid movement. Infantry of the line were armed with smooth bore muskets and bayonets. The short range at which these firearms could accurately hit a target and slow reload times led to massed formation to maximize enemy casualties and hand-to-hand combat was common. Please visit the Infantry page for more information about the Infantry of the Line soldier's basic kit. The role of the field artillery was to provide close support for the other men at arms and to attack specific targets. The artillery crew's purpose was to man the cannon (the gun). By the late 18th century, artillerists were considered elite troops, as these soldiers required the skill to do geometric calculations necessary to place a cannonball on target. In a time of widespread illiteracy, this was not a common ability. Artillerists were highly trained to work as a well-oiled machine with each member responsible for the safety of the entire crew. A three pound field cannon required a minimum crew of five artillerists, who each had a distinct job. Every artillerist was well trained and capable of rotating to any of the positions necessary to fire the gun. 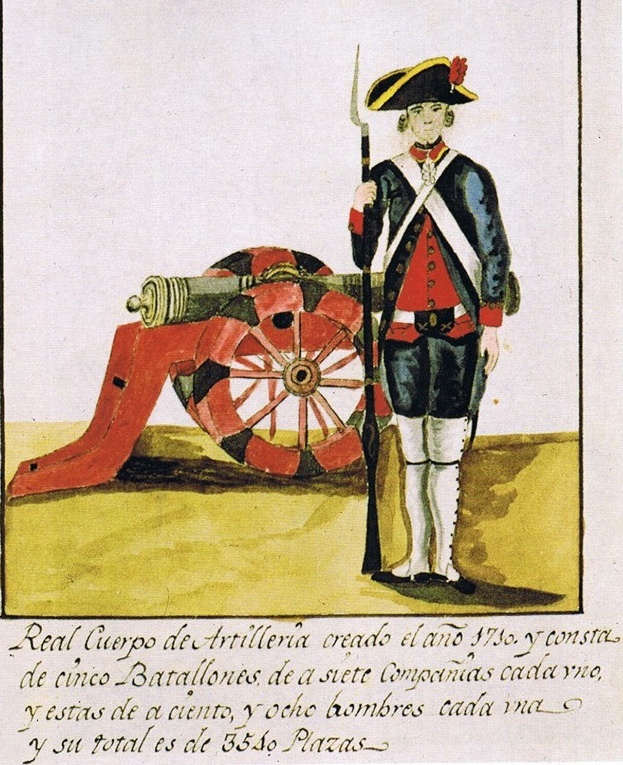 Matrosses (assistant artillerists), whose duties included guarding the gun and wagons on a march, were armed with muskets and were also part of the artillery crew. The artillery crew used a variety of tools in the process of firing the cannon. These tools included a worm, a sponge, a rammer, and a linstock (slow match). Please visit the Artillery page for more information about the Artillerist's basic kit. Amidst the distress and sufferings of war, civilians could always be found in and around the army's camps. Local sutlers brought wares and services to the soldiers and officers. Both men and women could be seen cooking, doing laundry, or sewing for any military personnel who could pay for these services. Unlike American war camps, the Spanish camp did not have camp followers, but that does not mean that women and children were not to be found. Wives and family members of military personnel often visited and stayed in camp, especially those of officers. Local townspeople were also to be found visiting soldiers. While in camp, women applied the traditional skills they learned as homemakers including nursing, sewing, and sharing solace and kindness with the soldiers. Because women were considered too simple to understand complex military strategy, men spoke freely around them. With this belief, women could have almost unrestricted access to soldiers’ campsites, even the enemy's camps. Women could enter enemy camps on the pretense of providing food, peddling wares or simply visiting while eavesdropping on conversations about troop movements, leadership changes, equipment shortages and deliveries without raising any suspicion. Thus, women made excellent spies. Whatever the circumstance, civilians who supported the army were oft times to be found milling about the military camps. Please visit the Distaff page for more information about the civilian woman's basic kit. Grenadiers were originally specialized soldiers, a distinct role first established in the mid-to-late 17th century for throwing grenades and sometimes assault operations. At that time, grenadiers were chosen from the strongest and largest soldiers. By the 18th century, as throwing grenades became irrelevant, grenadiers were still chosen for being the most physically powerful soldiers who could lead assaults on the field of battle. Grenadiers could also lead the storming of fortification breaches in siege warfare. 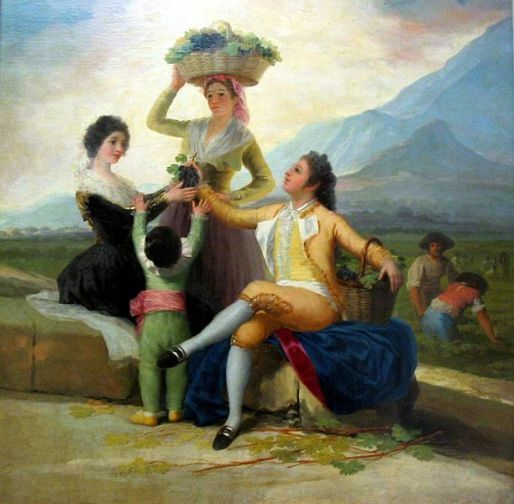 By the second half of the 18th century, grenadiers in the British, Spanish and French armies began wearing high fur hats. The purpose appears to have been to add to the apparent height and impressive appearance of these troops both on the parade ground and the battlefield. Whether for reasons of appearance or reputation, grenadiers tended to be the showpiece troops of their respective armies. Please visit the Infantry page for more information about the Grenadier soldier's basic kit. Light infantry members were often smaller, more agile men with excellent shooting ability and capable of using initiative. They required specialized training with an emphasis on self-discipline, maneuvers and the initiative to carry out the roles of both the light infantry and the infantry of the line. Fighting in widely dispersed groups rather than in disciplined ranks like the infantry of the line, demanded a keen understanding of skirmish warfare. Light infantry were expected to avoid melee engagements, unless absolutely necessary, and generally fought ahead of the main line to harass the enemy before falling back to the main position. Light infantry usually carried lighter, shorter firearms than the infantry of the line and were used as skirmishers, flankers and scouts. For more information about the Light Infantry soldier's basic kit, please contact Hector L. Diaz. Cavalry were soldiers who fought while mounted on horseback. Cavalry were historically the third oldest, after infantry and chariotry, and the most mobile of combat arms. Men fighting from horseback had the advantages of greater height, speed, and inertial mass over an opponent on foot. Cavalry were the primary choice for confronting enemy cavalry and extended linear infantry formations vulnerable to flank or rear attacks. 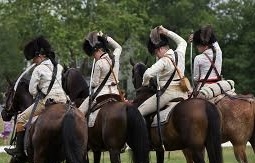 Infantry who moved on horseback, but dismounted to fight on foot, were known in the 17th and early 18th centuries as dragoons, a class of mounted infantry, which later evolved into cavalry proper while retaining their historic title. For more information about the Cavalry basic kit, please contact Hector L. Diaz. A privateer was a private person or ship authorized by a government by letters of marque to attack foreign shipping during wartime. The privateer's letter of marque typically limited activity to a specific area and to the ships of specific nations. Privateering was a way of mobilizing armed ships and sailors without having to spend treasury resources or commit naval officers, but being privately owned and run, privateers did not take orders from the Naval command. 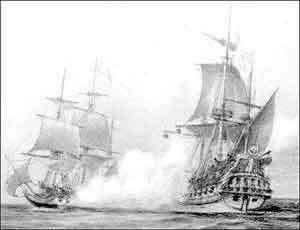 Privateers disrupted commerce and pressured the enemy to deploy warships to protect merchant trade ships from commerce raiders. If captured, privateer crews could be treated as prisoners of war. For more information about the Corsair's and privateers' basic kits, please contact Hector L. Diaz.